A correspondent asked about the use of a Jaycar LO1238 ferrite core in VK3IL’s EFHW matching unit for 40m and up. The LO1238 implementation would use 3t primary and 24t secondary on the core. If the transformer is simply used without an ATU between it and the radio, and we assume that the antenna system is adjusted to present low VSWR(50) to the radio, a simple approximation involves calculating the magnetising admittance of the 3t 50Ω winding, and calculating the portion of total input power that is dissipated in that admittance. 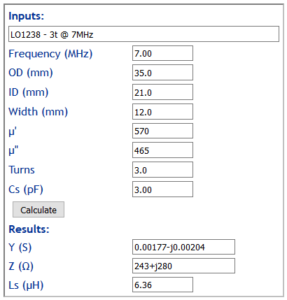 For a 50Ω match, the total conductance G is 1/50=0.02, and the percentage power lost in the magnetising admittance is Gcore/Gtotal*100=0.00177/0.02*100=8.9%. Now cores of this type heat up relatively slowly, but long term the temperature rise is around 10K/W/m^2 in free air. (This is a very conservative figure based on design methods for heatsinks, up to five times this dissipation might be achieved by radiation from high emissivity surfaces such as many ferrites.) The surface area of the core is about 0.0035m^2, and for temperature rise of say 70K, maximum long term average power dissipation is around 2.5W, less if enclosed. 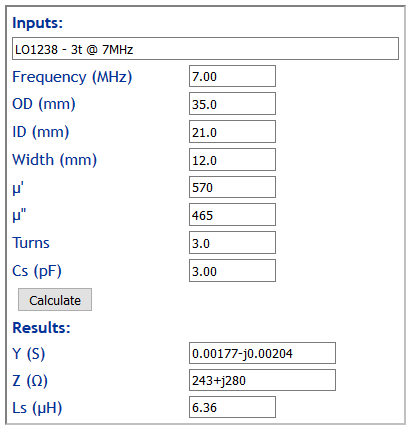 Pulling all this together, maximum continuous average RF power is around 2.5/0.125=20W, again less if enclosed. Heat wise, this transformer might work ok at up to 600W PEP SSB telephony (no speech processing) because of the very low average/PEP ratio of SSB telephony, but it would probably fail quite quickly tuning up with a 600W carrier. (It might not withstand the voltage associated with 600W PEP. Because of the risk of explosion of the ferrite (a ceramic material with risk of dangerous flying shards) under rapid temperature rise, such a device should be enclosed if used with a transmitter over a hundred watts… exacerbating the heating problem. For this application, I would be considering a higher Q core material (which could be ferrite or powdered iron), and then a size appropriate to the power requirement. Note though that reducing the core loss will reduce the bandwidth, so system tuning becomes sharper.